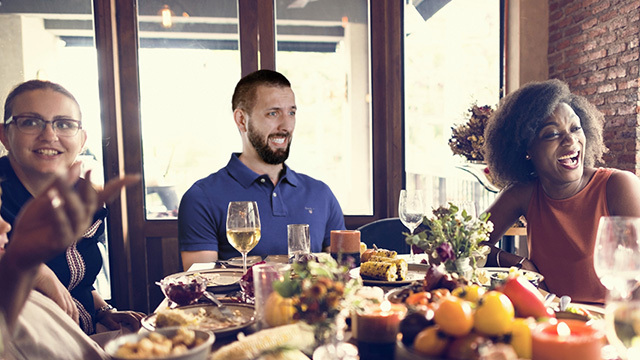 MILFORD, CT – A Connecticut man found himself unable to find a suitable topic of conversation at the family dinner table earlier this evening. Reports indicate that Andrew Klein, 29, sat for nearly an hour fumbling through generic responses and avoiding pitfalls into providing too much detail into what he has actually been doing in his spare time. Klein claims to have attempted several times to come up with a conversation topic, but was unable to think of anything appropriate due to the trending course of his recent hobbies. The young man reportedly struggled during several instances of the holiday dinner conversation including a discussion over television shows where Klein was forced to think of something that wasn’t an anime and an occurrence of his aunt inquiring if he had found a girlfriend yet. The situation almost turned dire when the conversation switched to music and Klein, in a moment of passion, accidentally stated that he was fan of Muse. Klein was able to quickly recover from the slip by claiming that he was talking about the English rock group, avoiding the potentially dangerous position of trying to explain the concept of idols to his unaware family. Despite sitting through most of the discussions in awkward silence, Klein considers the encounter to have largely been a success with most of his family fooled into thinking that he is just a regular below average individual rather than a lost hope to society. Sustaining on instant noodles and a wavering DSL connection, it is uncertain how Vestro has continued to survive let alone still form a cognitive thought. Regardless, he still manages to come out of his soba induced coma now and then. He can be found spending his time pretending to understand Japanese media as well as picking up the remaining shards of his broken dreams.